Not everyone appreciates a caterpillar but everyone loves a butterfly. That’s the way life is. However, you don’t get one without the other. That’s the way life is, too. I spent my last year of college hanging out with graffiti writers. (Ah, the tough things we do in the name of sociology research.) A dynamic bunch, in general. They schooled this rural white girl in ways that I’m still counting even today. While I was there they tuned me into a few key secrets that now I think everyone should know about graffiti. Second: Graffiti grew out of some young, poor inner-city kids needing a way to express themselves. They grabbed (literally–lots of time they stole) the only art supplies they had access to: spray paint, rollers, and shoe polish, and started to write their names all over town as a way to refuse how society was ignoring them. They write their names over and over: ME ME ME ME — SEE ME. DON’T IGNORE ME. Third: Some of these kids got really, really talented at it, some even became professional artists. Some even got famous. There are writers who scrawl their names and there are graffiti artists, who do full-scale murals. Many of these murals are real, commissioned works. The fact is, one form grows out of the other. And many artists still tag their name in their free time for fun. You can’t grumble at the tags on the walls and praise the inner-city mural without being more than a bit of a hypocrite. It’s like saying that you love monarchs, but hate how the caterpillars keep eating all the milkweed. I ‘m explaining this because I’m about to say something that you don’t usually hear me say and I don’t want you to take it out of context: I think Belo Horizonte is a city with a serious graffiti problem. I have traveled to several major cities: New York, Philadephia, Boston, Miami, Chicago, Lima, and Quito, to name a few. I have admired their walls, documented their murals, and tried to decipher the names behind their tags. 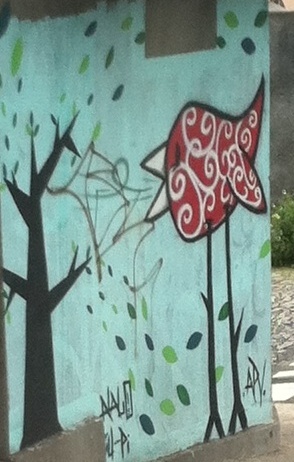 I have never seen such a chronic case of tagging as I did in Belo Horizonte. Holy crap. Those kids were astounding in the number and location of their tags. High up, on all sorts of materials. 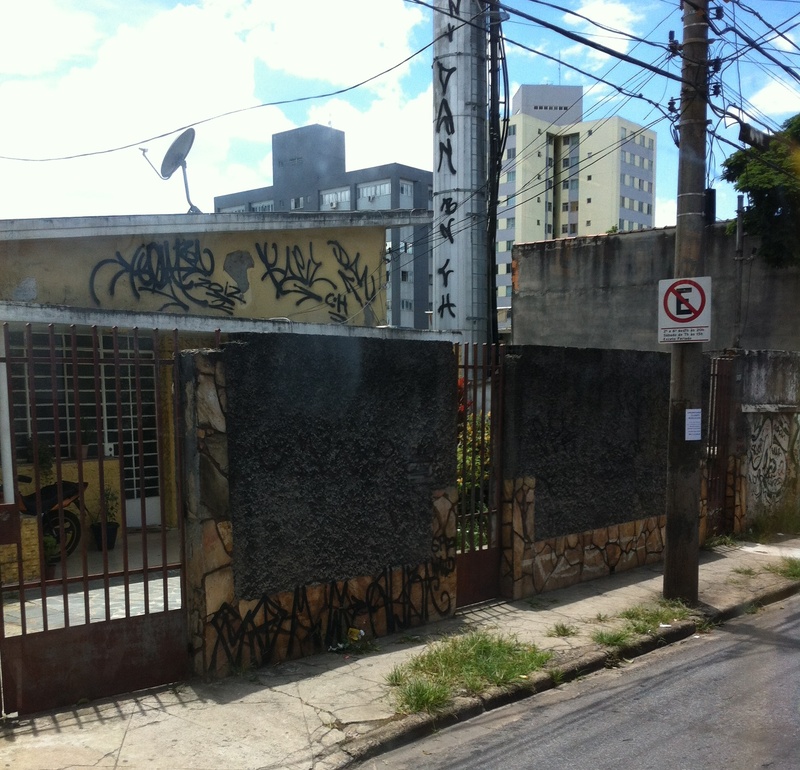 It’s hard to find a section of Belo Horizonte that isn’t covered in graffiti. It blankets the city like kudzu. It’s easy to imagine that this much graffiti is limiting economic growth (even the richest neighborhoods looked trashed) and bringing down property values. My next reaction was probably less common: these walls make me want to cry. Remember, these are the names of youth (mostly young men) who feel that they don’t have a voice, that feel the compelling need to say their name over and over to the world. 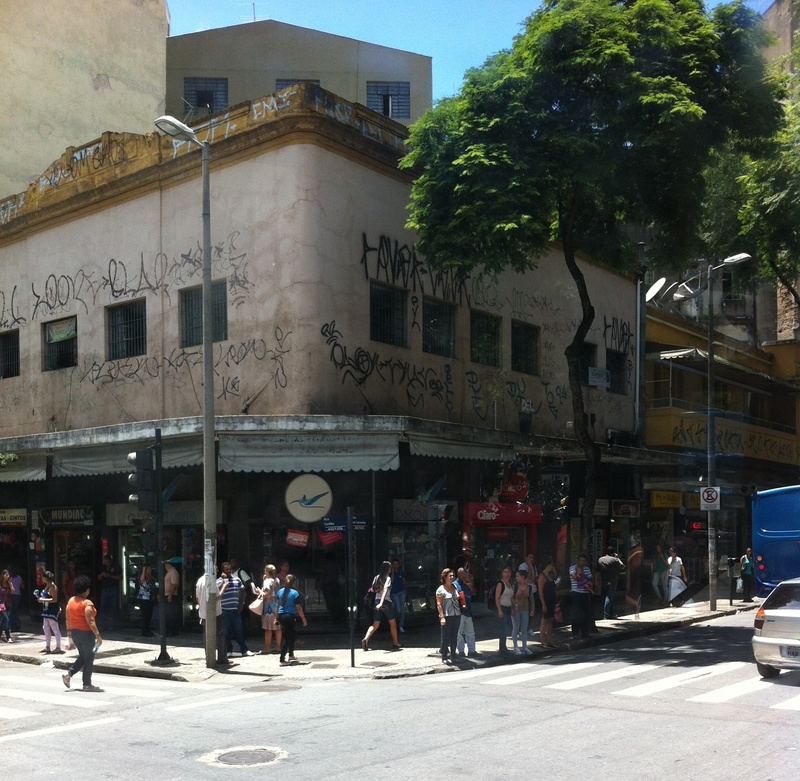 And Belo Horizonte has a case of this social malady like I’ve never seen. What causes this? I can’t say, but these walls tell me that for all that Belo Horizonte advertises itself as a modern, progressive metropolis, it still has a long way to go. As I rode the bus day after day through neighborhood after neighborhood covered in tags my heart mourned for these kids. There’s only a few ways to combat graffiti. You can paint over it, but you’ve got to be consistent and relentless. Otherwise you’re just giving them a periodic blank canvass. You can try to make it more difficult for them to paint. A few residents of Belo Horizonte had resorted to textured walls (works sometimes) or growing ivy (a great green solution). You can arrest them. But that doesn’t get at the problem of why the kids write, and criminalizes youth who usually don’t have any other priors. Another solution–in my opinion a better and more socially responsible one–is to encourage the growth of those caterpillars into butterflies. Lots of these kids are artists who will never see the inside of a design school. Why not help them bloom? Encourage them to move as quickly as possible from one phase to the next? Commission their work. Give them free spaces (“permission walls”) to do their thing. The great thing about this solution is that if you get a respected graffiti artist to do a large mural, the other writers are unlikely to tag over it. They respect their own. If you pay that respected graffiti artist to do their art, then the kids have someone to look up to and a positive outlet for their art. I can’t put my finger on it either, but I think I know what you’re talking about. I’ve banged my head on it more than once. Maybe it’s not an unwillingness to do things well or better and instead a reluctance to move outside the comfort zone of how things have always been done? It seems that once an entrepreneur comes along and starts a new thing and shows that it can be successful everyone wants to do it too. Luckily maybe ~10% of Brazil’s population is this personality type so growth appears to go in spurts. Completely based on unscientific, anecdotal observation, of course.